Benzaiten Center For Creative Arts Invites You To A Dark Arts Ball On Friday, October 26th For Art, Magic, Mystery, Potions, Infernos! All Ages With Costumes Welcome! The Halloween Party at Benzaiten Center For Creative Arts will be like no other! 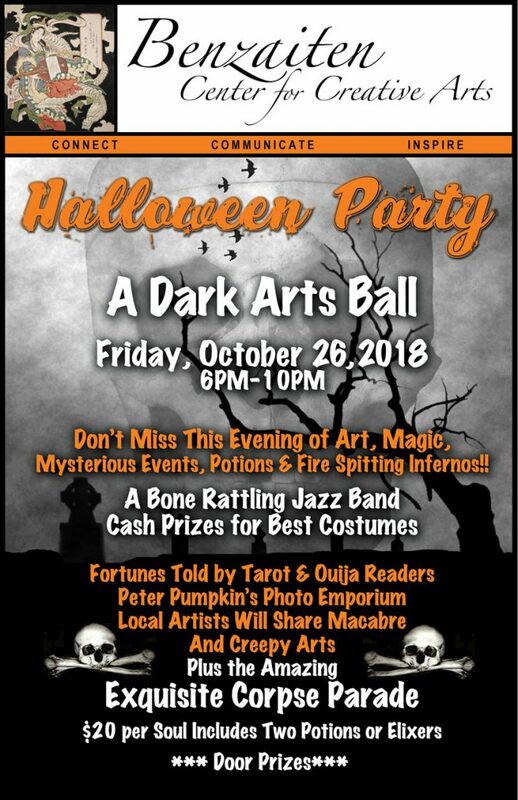 “A Dark Arts Ball” on Friday, October 26th includes a jazz band, Tarot and Ouija readers, photo booth, costume prizes, refreshments, artwork, magic, and the fire spitting infernos! There is free parking and you pay at the door, if you dare! The Rickie Report shares the details and can’t wait to hear about your eerie experiences! Cash prizes for best costumes!
! DO NOT USE GPS ! It will take you the wrong way. Exit I-95 at 6th Ave. South and go East. Abstract artist, Eileen Shaloum‘s SOLO Exhibition at the Benzaiten Center for Creative Arts opens Friday, March 23, 2018 through April 5, 2018. Her latest body of work, “Invisible Cities,” is inspired by the book of the same title by Italo Calvino. Eileen was moved to interpret those descriptions into fantastic landscapes, which she calls “Dreamscapes.” Get lost in the villages, climb the stairs and ladders to nowhere, and wind your way over the roads that bring you deep into these colorful works of art! In some of these pieces, there are thoughts, reflections, and musings with which the viewer might identify, as well. 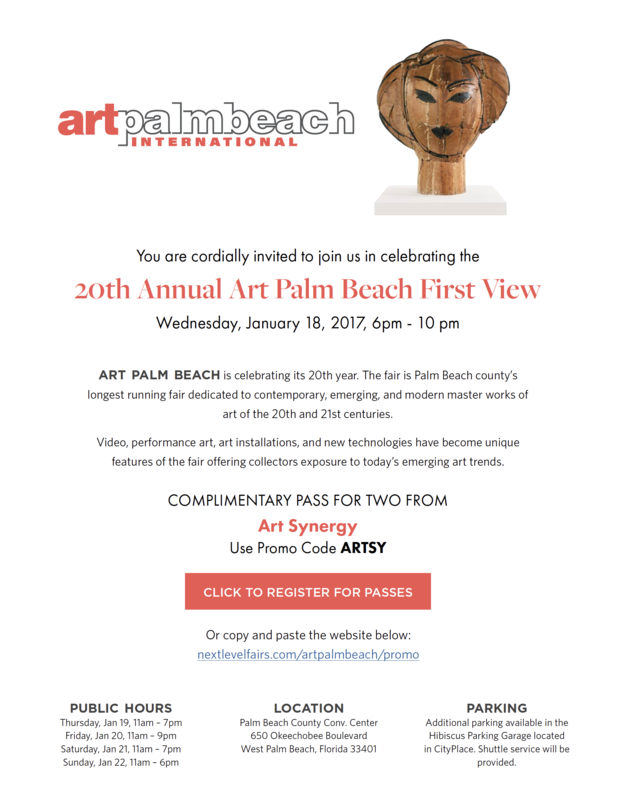 The Rickie Report shares some sneak peeks and details here about two receptions on Friday, March 23rd and Saturday, March 24th and opportunities to meet the artist! Directions: DO NOT USE GPS! Classes & Large Group Tours by appointment. Please call 561.508.7315 for more information. 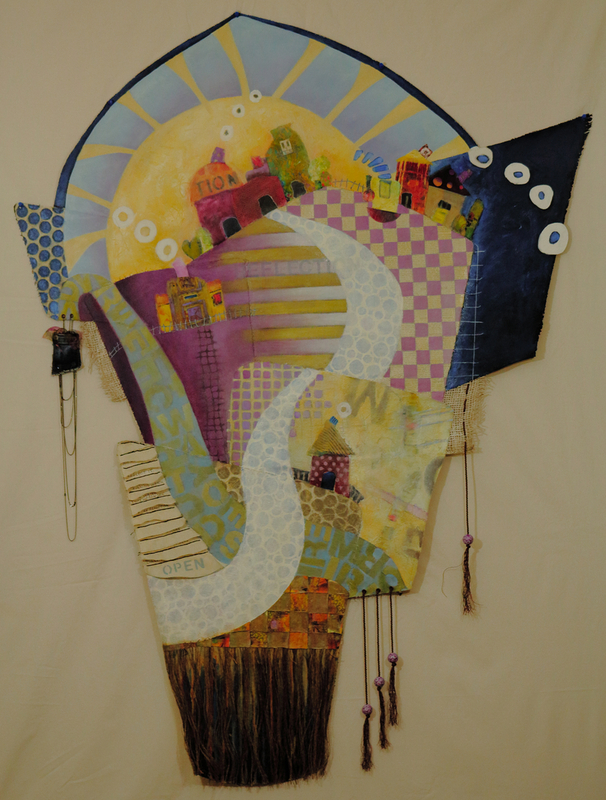 Eileen Shaloum will be exhibiting her hangings, as well as some abstracts on stretched canvas at Benzaiten Center for Creative Arts from March 23, 2018 through April 5, 2018. Her exhibit coincides with the Center’s fundraiser, “The Wearable Art Show,” on Friday, March 23rd 6- 10 pm, which is an event with live music, cocktail reception, wearable art vendors, fashion show, and glassblowing demonstrations. The event raises money for children’s programs and scholarship funding. The cost for that event is $50 per person. A second, FREE, Open to the Public Reception takes place on Saturday, March 24 from 2 – 5 PM. There will be glassblowing demonstrations and refreshments. 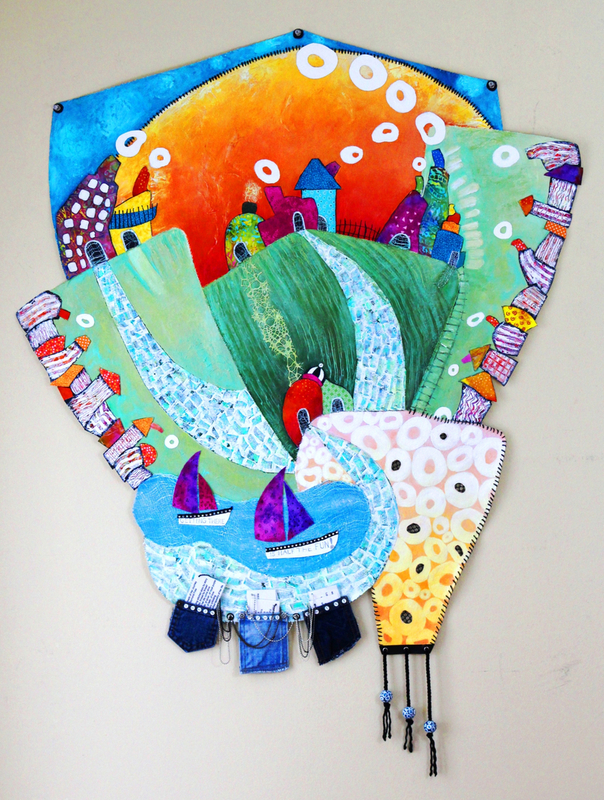 Eileen is a painter and mixed media artist who finds the whimsical in her subject matter. Her latest body of work, a group of abstract compositions on un-stretched canvas, is an extension of her “Invisible Cities” series. 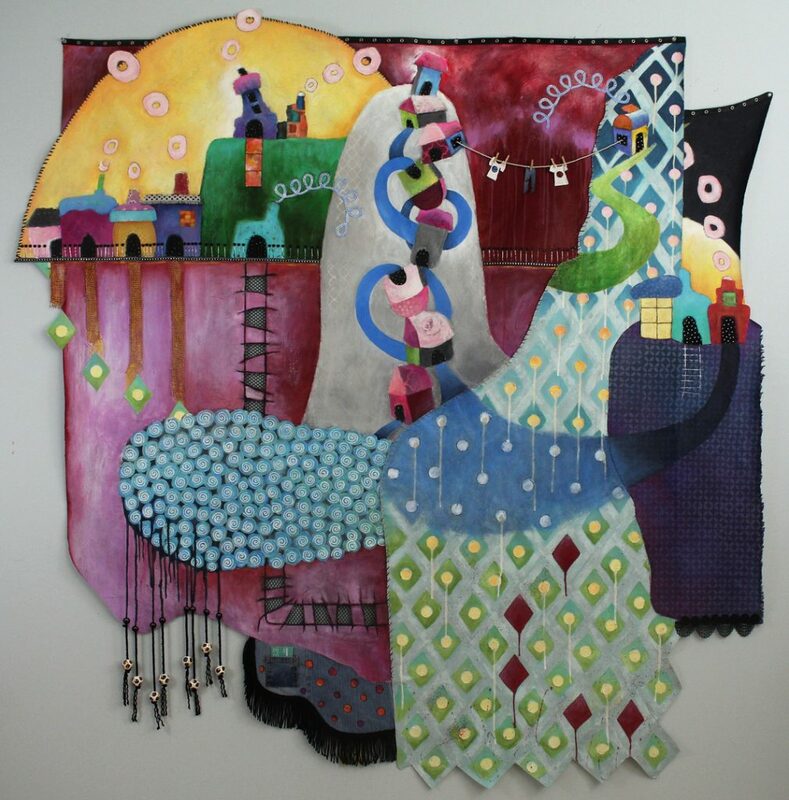 These hangings, constructed by sewing and gluing canvas pieces together, are then layered with paint and textural components, such as fabric, papers, string, beads, and found objects. 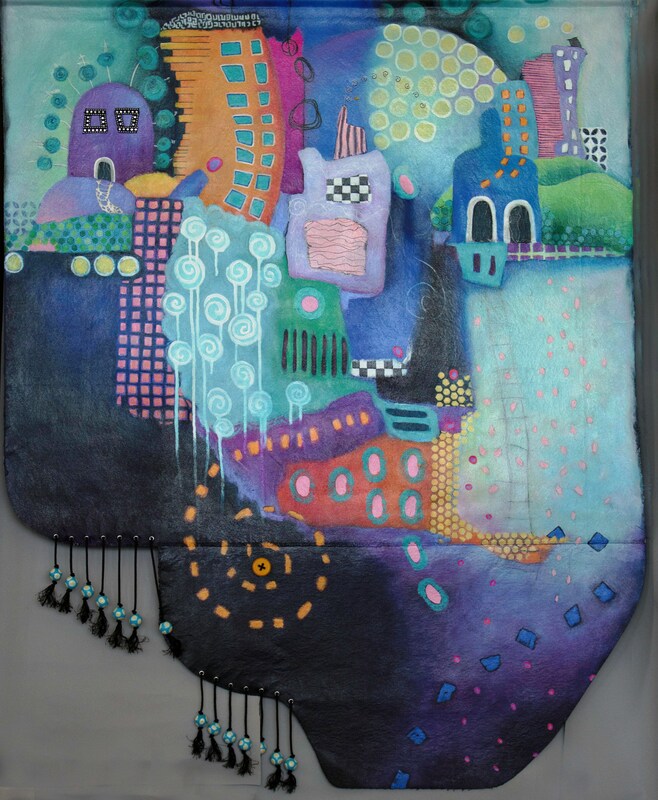 By using canvas in a variety of shapes, she is not limited to the confines of a square or rectangular picture plane. The joyful and imaginary quality of her style invites the viewer to interact with the themes of these spirited compositions. Her use of bright colors, mark making and layering paint with textural components, show great spontaneity and freedom. Eileen tells The Rickie Report, “I am an abstract painter and mixed media artist who enjoys working with a variety of subjects, real, surreal or pure abstraction. I bury images under layers of paint, pastel, charcoal, found objects, cloth, photographs and collaged paper. I frequently use written passages, which may include poetry, quotes or old letters, in support of my message. I play with line, shape, texture and color trying to draw the viewer in to interact with the themes in my spirited compositions. Reflection on life is what inspires me. I base my themes on the world around me. Whether it is women’s issues, the everyday trials and tribulations of humanity, or my travels to awe-inspiring and exotic locations, my work is a reflection of things that are important to me”. Eileen earned her Bachelor of Arts in Art Education and her Masters in Art History at Hofstra University, Hempstead NY. To further her knowledge and skills as an artist, she has participated in workshops in the United States and in Italy. Eileen is an active member of numerous art-related organizations, including: Florida Artists Group (FLAG), National Association of Women Artists, ​National Association of Women Artists (Florida Chapter), Art League of Long Island, WITVA-Women in the Visual Arts, Boca Museum Artists’ Guild, and the Delray Beach Art League. The Rickie Report shares the details of two job opportunities at the Benzaiten Center For Creative Arts in Lake Worth, FL. 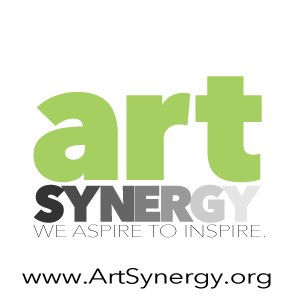 Located in the Lake Worth Arts District, this 14,500 square foot permanent arts center is dedicated to living and working artists as well as to the community. The Center brings art to life, immersing the public in arts production and its creative processes, while providing direct interaction with artists from around the world. Duties include: Teaching, Assisting/Gaffing Production work, assisting with events and performing routine maintenance and charging. Benzaiten Center for Creative Arts in South Florida is looking for a friendly and outgoing flame working instructor. • 4 years teaching experience required. The Benzaiten Center for Creative Arts is located in the Historic FEC Train Depot just a few steps from the heart of downtown Lake Worth. Located in the Lake Worth Arts District, this 14,500 square foot permanent arts center is dedicated to living and working artists as well as to the community. The Center brings art to life, immersing the public in arts production and its creative processes, while providing direct interaction with artists from around the world. The Glassblowing Hot Shop is a full service 5,000 square foot facility with three glory holes, two furnaces, multiple annealers, and a large cold-working room. The Flameworking Studio is a 750 square foot air-conditioned room with multiple stations with various torches and multiple kilns. The Fusing Studio is a 750 square foot air-conditioned room with large work tables and multiple kilns. The Welding Center is in an outdoor well-lit area of the building protected by a large 20’ high overhead roof. The Gallery and Gift Shop is an elegant 2,000 square foot air-conditioned space that serves to showcase our rotating ‘Visiting Artists’ exhibitions. The Benzaiten Center for Creative Arts has a protected viewing area with bench seating for visitors and demonstrations. 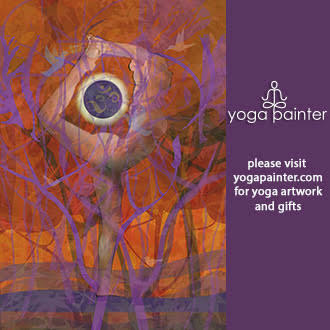 Visit us to see artisans creating beautiful fine art sculptures or take classes. Come experience the excitement of creative synergy at Benzaiten. You too can become an artisan! How many Galas are casual? How many are held in a 14,000, square foot Historic FEC Train Depot building? How many Galas have glass blowing, flame working, and fusing demonstrations going on during the cocktail hour??? Honoring their namesake, the Oriental Goddess, “Benzaiten”, it will be an Asian inspired affair with some of the guests opting to come in costume. Benzaiten Center for Creative Arts will have great live entertainers besides all their staff, who will be performing live glass demos and a lovely sit-down-dinner. All funds raised by the Gala will help pay for ‘Children’s Programming,’ ‘Scholarship Programming,’ and Benzaiten’s continuing mission of providing professional services to the artists in our community. The Rickie Report shares the details and urges you to make your reservations now for this April 8th event! Classes & Large Group Tours by appointment. Please call 561.508.7315 for more information. Benzaiten Center For Creative Arts welcomes the public to 3 days of events featuring internationally renown glass artist, Rob Stern. Mark your calendars for March 16th, 17th and 18th for glassblowing, dinner, and music plus a Free Family Fun Day! The Rickie Report shares the details and some sneak peeks! Rob Stern is a real showman and works large so his demonstrations are extra dramatic and should not be missed. Nowhere else in Palm Beach County is there a facility that brings in these types of world renown artists to blow glass in front of large audiences in real time. It is a sizzling hot experience! TO THREE DAYS OF EVENTS! The “Last Call” will not be happening from 8pm-10pm on Friday night. As that was St. Patty’s Day, we were not able to engage a band, so we are doing it after the Saturday’s public demonstration from 7pm -9pm. Born in Miami, Rob was reared in Atlanta where his mother taught art and his father worked in the movie industry and dabbled in photography. Rob attended Northside High School for the Performing Arts, in Atlanta, where he was a member of an elite touring group, singing dancing, and acting. While active in many traditional sports, he also enjoyed skateboarding, surfing and rock climbing. All of these factors combined with the inventive and adventurous spirit he inherited from his grandparents, would be important to his future career as a glass artist. Rob attended San Francisco State University where he studied art and discovered glass making. He worked as an apprentice at John Lewis Glass, an industrial casting facility in Oakland for five years. He traveled to Europe touring glass factories for a semester and then returned to begin his study at the Pilchuck Glass School, renowned worldwide for its glass programs. Rob went on to study, apprentice and assist numerous artists/masters at Pilchuck and other schools. In 1992, after working as a teaching assistant for Czech master, Petr Novotny, Rob was invited to work in the Ajeto Glass Factory in the Czech Republic. It was the start of a long term working relationship, as he lived and worked there for a number of years. He continues to work closely with Petr both in Ajeto and doing demonstrations and conducting workshops throughout the world. From 1997-2003 Rob taught glassmaking at the University of Miami, FL and earned his MFA. Rob now co-teaches with many artists/master at schools worldwide and frequently travels abroad to make his work. He has been invited to work as a master craftsman in both the US and Europe. In 2003, he established Rob Stern Art Glass Inc. in Miami , where he now works with his team on many commissions and personal sculptures. “I consider myself to be very fortunate to have traveled, studied and lived in many places where glass is made by masters. I have experienced many cultures, techniques, and the people who I have met have greatly influenced me. I draw my inspiration from this, from music and from mostly everything I see in nature. Working as a glass artist has enabled me to view the world as fluid, reflective, and full of light. I strive to express emotion in my work and my other primary goal is the share the gift of glass with others”. Benzaiten Center For Creative Arts welcome the public to three days of events featuring the art of renown glass artists, Julia and Robin Rogers. Mark your calendars for February 23rd, 24th, and 25th for glassblowing, dinner, and music plus a Family Fun Day! The Rickie Report shares the details and some sneak peeks! This is a great family day featuring a 3 hour public demo by the visiting artists. Husband and Wife Team, Julia and Robin Rogers tell The Rickie Report, ” We are enlivened by the inherent qualities of molten glass; its luminosity, viscosity, and seductive flow. Our interdisciplinary approach incorporates blown and sculpted glass with electronics, sound, light, shadow, and a host of other materials. Inspiration is around us all, our work is specifically driven by humanity, nature, science, and music. Collaboratively, we meld our ideas into, what hopefully are, contemplative, intriguing, and thought provoking works. In addition to sculpture, we create installation and performance”. Some of their series include, “Animalia Fantastica,” “Sentient & Sapient,” and “Architecture of the Mind.” “Animalia Fantastica” is a series of blown/sculpted anthropomorphic glass figures. Since the advent of human expression, animalia has been a driving source of inspiration. In fact, the oldest cave paintings depict animals and the hunt. This narrative continues in “Animalia Fantastica” touching on nourishment and sustainability. “Sentient & Sapient” is a series of blown glass heads with mixed media that delves into our subject’s psyche. These pieces physically and metaphorically open up to reveal the interior workings of the mind. In “Architecture of the Mind,” heads are turned into buildings and the occupants and history of these buildings tell the story of the subject. Looking through the windows the dynamics of life are ever present. “With performance and installation, we are able to broaden our ideas, creating a larger picture. Ideas of collective conscious, life cycles, perception, and an advancing technological civilization are prevalent in this work. In the “Journey,” a performance, using a video projected and reflected in a pool of water, we tell a story that begins in a modern, active city in the rain and takes viewers backward through time to the beginning of all life on earth. We use hot glass in this piece to represent the primordial ooze where life first emerged. We are two artists living, breathing, and working together. Our minds never stop imagining the possibilities of what can be explored, discovered, shared, and executed”. Marlene Rose is one of Florida’s greatest artistic treasures. She is one of the top glass artists of our day and lives right in our midst in Clearwater, Florida. However, Ms. Rose will be visiting Lake Worth for three days of events, April 28th, 29th and 30th at the new Benzaiten Center for Creative Arts. This will be a rare opportunity for people in our community to see this nationally renowned artist perform her magic. The Rickie Report shares the details and urges you to sign up while spaces are still available! Marlene Rose’s unique work refers to a personal system of symbols that derive their power and strength from the common core shared with our ancestors. Rose rides this ancient energy, and, through the glass, reaches out into time, linking the fragments of what she sees and her part-remembered memories of the past. These glimpses become her visions, and her visions soar into the future, frozen forever in the icy-hot stillness of the glass. Rose uses a process based on the thousands-year-old tradition of bronze casting, adapted only recently for glass. She pours liquid molten glass into a carefully prepared sand mold, then cools it for six days or more in a specially controlled oven before cracking open the mold and seeing what she has made. This method of making the glass aligns perfectly with the imagery she sees. The rawness and the immediacy of working the sand; the thrill and danger of pouring this magical lava, thousands of degrees hot; and the patient gestation of the piece in the annealing oven. These processes all inform, and are integral in, the final finished creation. “The glass may look like a relic of some ancient time, but each piece holds inside itself the sum of the sharp shards of what I have seen, of unnamed emotions, of visions, concepts and memories. These common threads of human imagery, passing through cultures and time… I am compelled to weave and recompose their nuances, all to communicate the immortal vibrancy of the human spirit”.